I strayed by mistake into a room full of S.S. officers, Gruppen- and Sturmbannführers, black from their lightning-flash-collars to the forest of tall boots underneath the table. The window embrasure was piled high with their skull-and-crossbones caps. In 1934, 18-year old Patrick Leigh Fermor walked on foot from Holland to Constantinople, which also meant that he had to cross Nazi Germany. But of contemporary political events he records little in his classic work of travel writing, 'A Time of Gifts'. Instead, the youngster is most fascinated by the palpable history in the Gothic old towns of Germany, the still-feudal society structures outside of towns, and the odd tipple. Besides a pub chat about Herr Hitler now and then, no one seems to be interested in engaging the youngster in political talk or even convince him to join their side. Two years later, in April 1936, a group of English students between 12 and 14 years of age along with their teacher hiked up Schauinsland, a mountain in the Black Forest, a challenging hike even when undertaken in favourable conditions. Just short of the summit, the group - inadequately equipped and clothed - was engulfed in a blizzard, and severely lost. Hours later, some of the boys made it to a nearby village, from where a search party set off to rescue the scattered group from storm and darkness. By that time, four of the group of 27 were already frozen to death or had died from exhaustion. This tragic event became locally known as the Engländerunglück, literally ‘The Englishmen’s calamity’. These two events, the travails of an unperturbed vagabond and the tail of doomed yet innocent youngsters exploited by Nazi propaganda, are perfect examples of how visitors from the anglophone experienced holidays in Germany between 1933 and 1939. Few specifically came to see how the new Nazi state remodelled society, many came for steins full of beer, castles, deep forests and cheap accommodation. In 'Travellers in the Third Reich', Julia Boyd provides an excellent overview of the types of visitors that came to Nazi Germany before war erupted, by weaving many sources and eyewitness accounts together. Boyd's travelogues do not begin with Hitler's rise to power, but instead record views and statements of tourists and visitors right from the end of World War 1 and the birth complications of the Weimar Republic. From there on it chronologically follows the developments in Germany up until August 1939. The 21 chapters are arrayed both chronologically and topically - there is 'Old Soldiers' about visiting veterans, 'Hitler's Games' about the Olympic Games 1936, and visitors being increasingly confronted with the growing anti-semitism in '"Peace" and Shattered Glass' in the wake of the Munich Agreement and the Kristallnacht 1938. The story of Unity - the fifth of Lord and Lady Redesdale's famous brood of seven - is that of an unhappy, not particularly bright young woman finding glamour and purpose in a cult religion. She might have become prey to any number of eccentric beliefs or deities but unfortunately for her, and those around her, she fell for the Führer. On the road back to Rauden, they met 'hundreds' of tanks and lorries filled with soldiers. 'All a bit terrifying,' commented Joan. But anxiety melted away as she was absorbed once again into the daily pattern of riding, swimming in cold forest pools, parties, practical jokes and the inevitable tennis. 'Travellers in the Third Reich' is a hefty tome in hardcover, and surely nothing for the beach. But all the different sources and viewpoints are neatly weaved together and I almost devoured the book, eager to learn more about the many protagonists - and if the reader gets lost in all those fellow travelers, there's a handy dramatis personae at the end of the book; which also comes with a fine cover imitating a 1930s tourists add by kid-ethic.com, as well as maps and black-and-white images. Two things stand out: the widespread anti-semitism that prevailed also in the anglophone world before the 2nd World War, and how naive many of the visitors are when faced with obvious propaganda or even criminal machinations they witnessed. This is an important and nuanced book, one that shows that not all the people from future Allied countries perceived Nazi Germany as dangerous, and that a feeling of goodwill was quite strong especially in Britain in those years. And it shows that something we, in hindsight, might call dark tourism was not so dark for those undertaking it, as long as the streets were clean and the beer was flowing. Paddy Fermor made it to Istanbul, and spent the remainder of the 30s in southern Europe and Greece; only to be called back to England to join the army in 1939. Because of his knowledge of the area he became a Special Operations Executive and parachuted into Crete, where he became one of the few Englishmen aiding the local resistance fighters, famously capturing German general Kreipe in 1944. The pupils from Strand School never returned to Germany; the father of one of the victims, Jack Eaton, led a futile legal battle against the failings of their guardian teacher, and in the end erected a private memorial to his lost child, one that was not utilised by the Hitler Youth - maybe because the story behind it was too personal, unusable for any propaganda effort. Nazi Germany affected them all, in one or another. In her afterword, Boyd underlines the fact that the 12 years of Nazi Germany are not only still an endlessly fascinating period of time; but that these days it is imperative to look at the reasons for the rise of the Nazis and what it means for us today, still. More than eight decades after Hitler became chancellor we are still haunted by the Nazis. It is right that we should be. 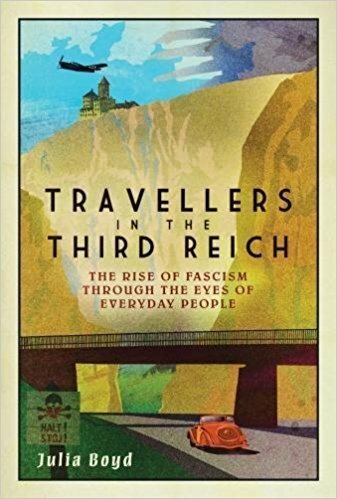 Travellers in the Third Reich: The Rise of Fascism Through the Eyes of Everyday People (2017) by Julia Boyd is published by Elliott & Thompson. Support your local bookshop! Marcel is the books editor of Elsewhere: A Journal of Place and author of Babushka’s Journey: The Dark Road to Stalin’s Wartime Camps. This November, Marcel is launching the books with a series of events in Berlin, Dublin, Belfast, Dundalk and Solingen. You can find details of Marcel’s book tour here.